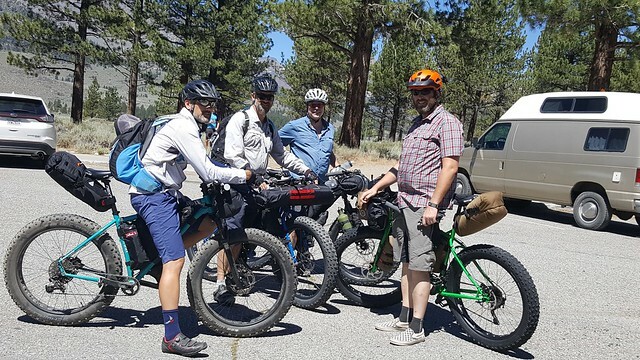 Earlier in July we got down to Mono County, CA for a three day bikepacking tour of the area between June Lakes and Mammoth. 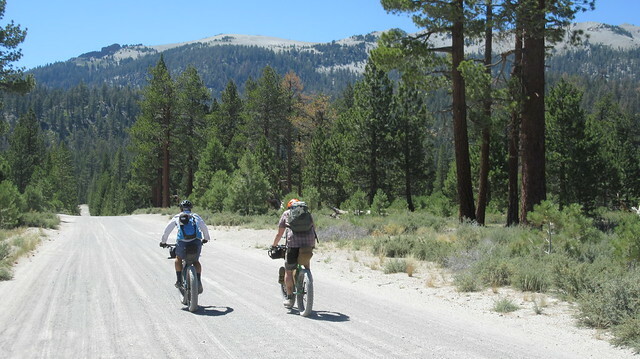 The 44 mile route took us through the dry woods of the Inyo National Forest, a zone where the high desert and mountain trees come together. 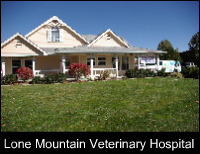 The terrain is volcanic in nature, the sandy route passing through valleys at 7,400 ft elevation and mountain passes at 8,300 ft elevation. The following is a story of our fun adventure. 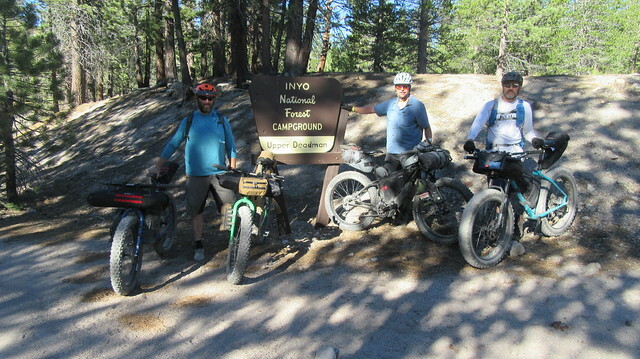 We started and ended this ride at the June Lakes Junction. There’s a parking lot to the southwest of the general store here for overnight parking. 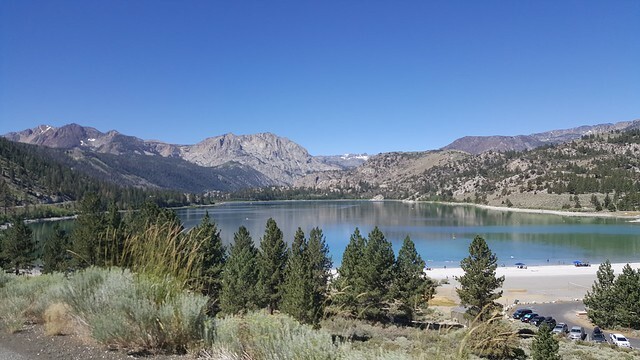 Possibly more important, though, is that June Lake Brewing is less than three miles from this point, a fact that we’d be sure to appreciate on the return trip. 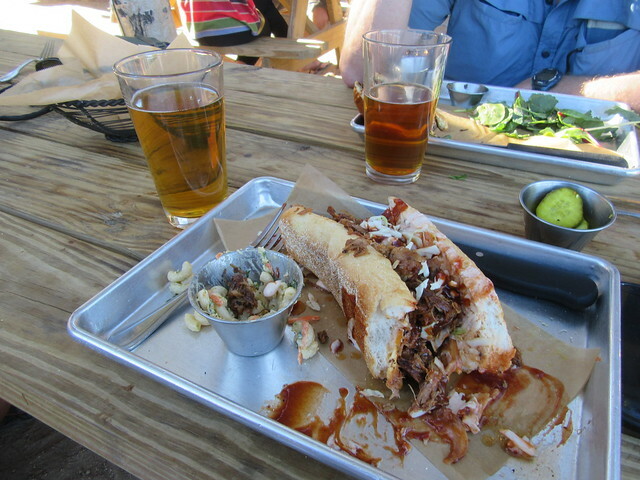 And interestingly enough, the farthest point south on our route would be the Mammoth Brewing Company. “Funny how the logistics are being built around beer.”, I said in our email planning dialog. 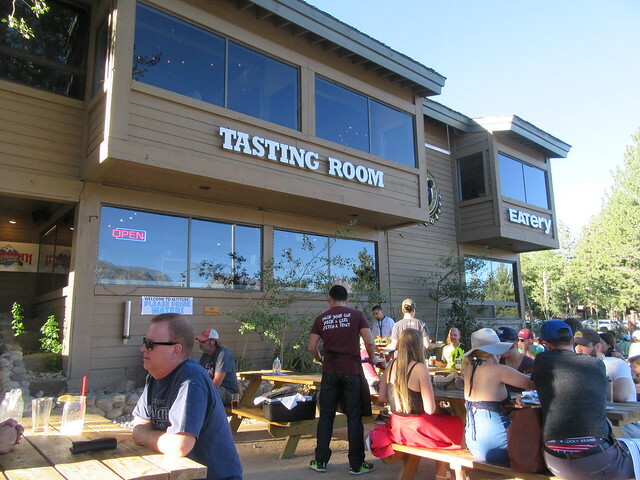 To which I received a quick and terse response, “I fail to see the humor in this.” A few different variations of routes were developed, but all pivoted around these breweries, two oases in the dry forest. With only two creeks as natural water sources along the route, perhaps I had overlooked the importance of these two man-made watering holes at the far ends. I planned our route using computer mapping software and paper maps. While this works quite well and gets you in the ballpark, you never really know what you’ll find when you get there. 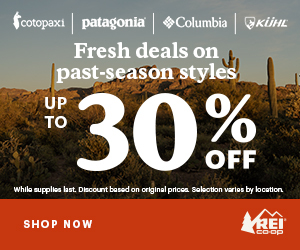 Satellite imagery and topo maps don’t show things like deep sand, rocks, and sticker bushes, and it is always steeper in real life. 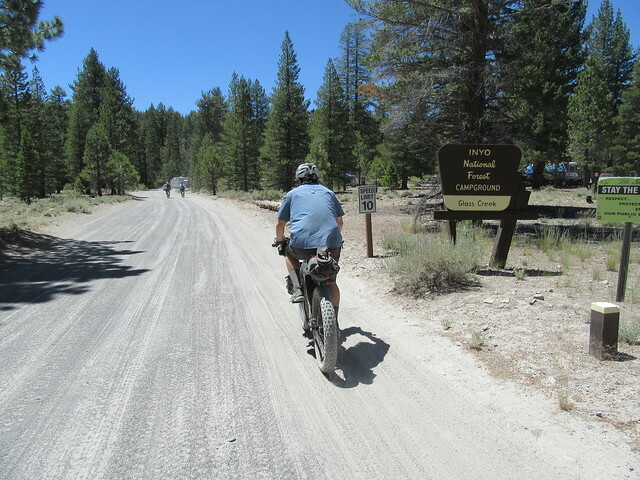 We rode up HWY 395 to get around the first steep hill, then jumped onto the first dirt road. We were quickly overwhelmed with deep sand and steep climbs, so we bailed out back to the highway to find a more suitable route. 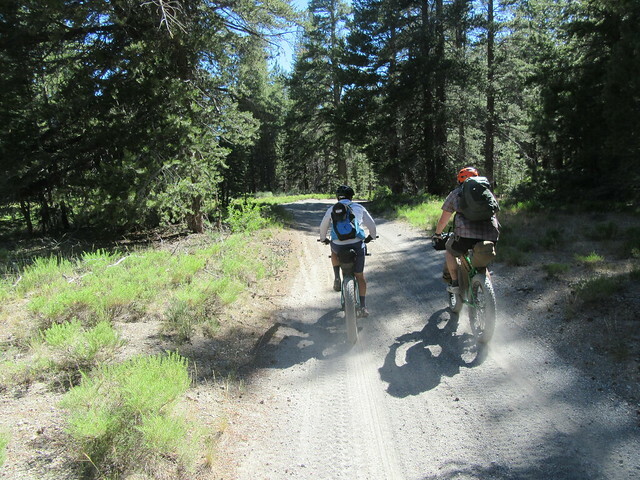 We eventually found a mellower dirt road, then rejoined the planned route. 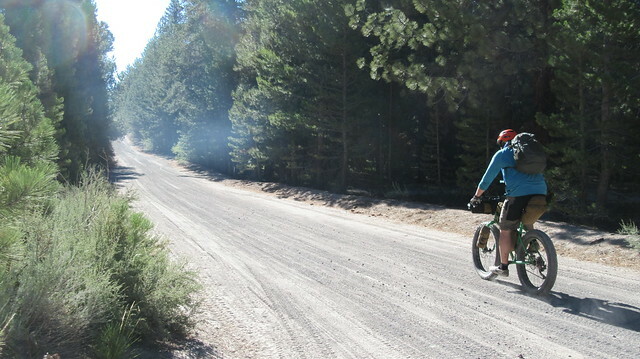 Although we stuck to dirt roads and pavement on this trip, we were glad to have the fat bikes. 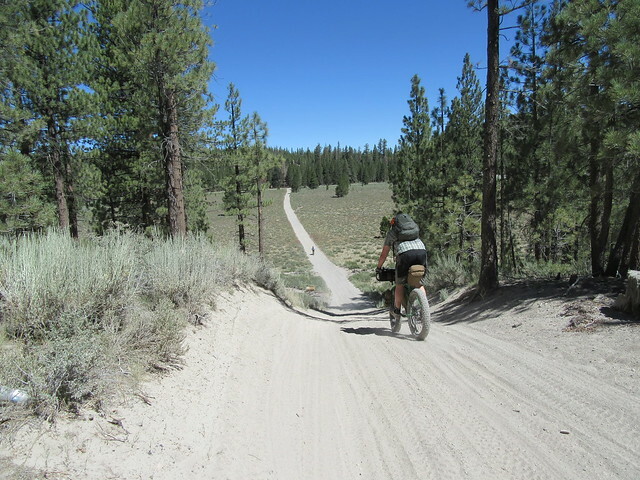 The dirt roads were mostly decomposed volcanic pumice, coarse sand that felt like a runaway truck ramp at times. They made us work, sometimes even on the downhills. 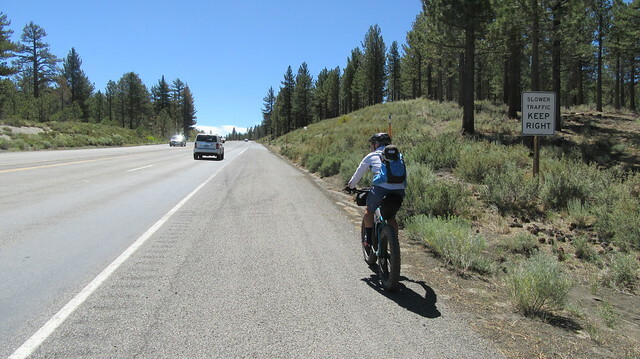 We were happy to get a break on the main routes like the Obsidian Dome Road and Deadman Creek Road, as these were more packed down, even allowing 2 wheel drive cars easy access. 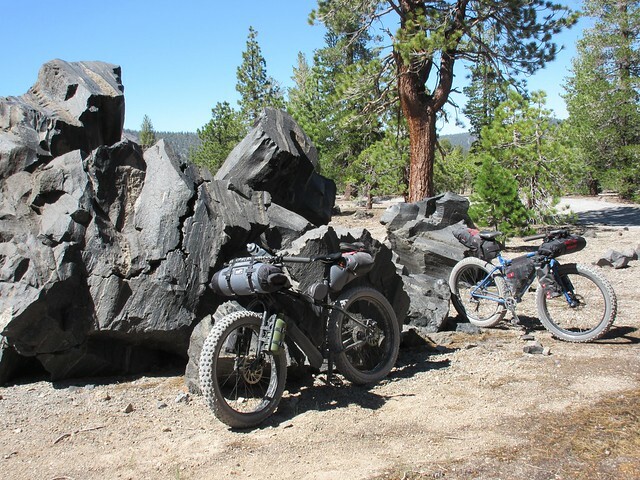 We followed the Obsidian Dome loop for some sightseeing. 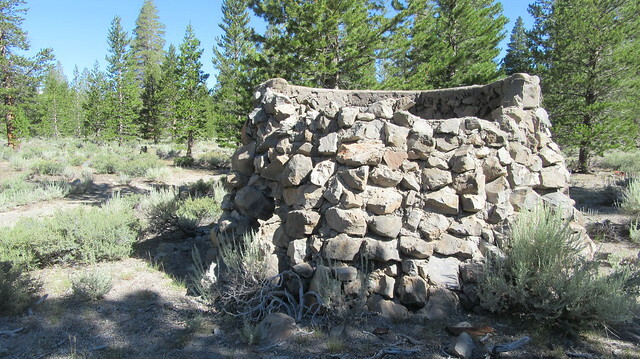 Domes like this one are composed of gray rhyolite, frothy pumice, and black obsidian. The domes were created by a Phreatic Blast, an explosion that takes place when magma reaches the water table, turns the water to steam, the magma then pushing up and cooling to create rock. It is the high viscosity of the lava that prevents it from flowing far from the vent from which it extrudes. 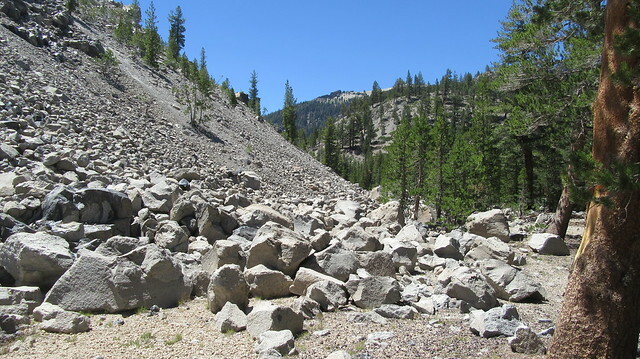 Although the dome was mostly grey, big boulders of obsidian were scattered within the rock pile. True to the description, though, most of the rock debris stopped right at the bottom of the dome. 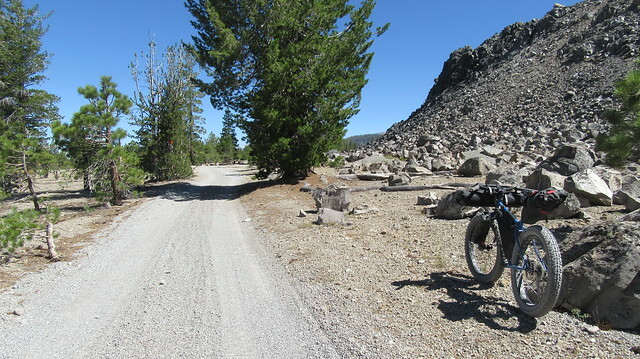 On the south side of Obsidian Dome, the easy road turned to a steep and twisty Jeep/ATV road. There is no road that continues south here, so we dropped all the way back down to the Highway, losing all the elevation that we gained and then some. This section was the most fun downhill of the whole trip. 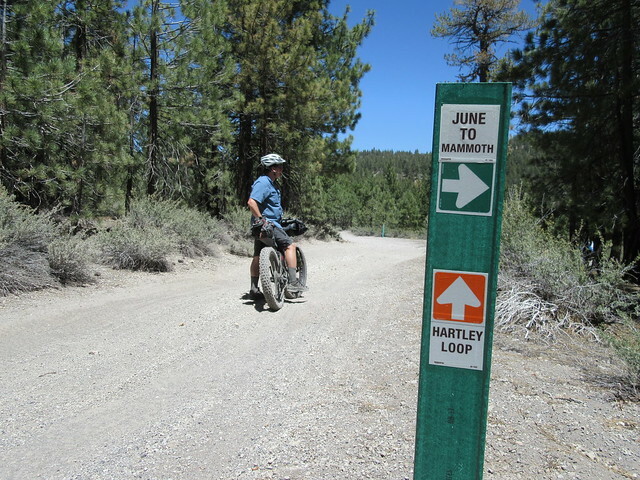 We started to see signs for a June to Mammoth Route. Since this was exactly what we were doing, it was nice to see that maybe we were doing something right. As the miles went on, though, it seemed that we saw these markers on several different roads, and that maybe there is not a single designated road, but a network of roads that take you in the right direction. 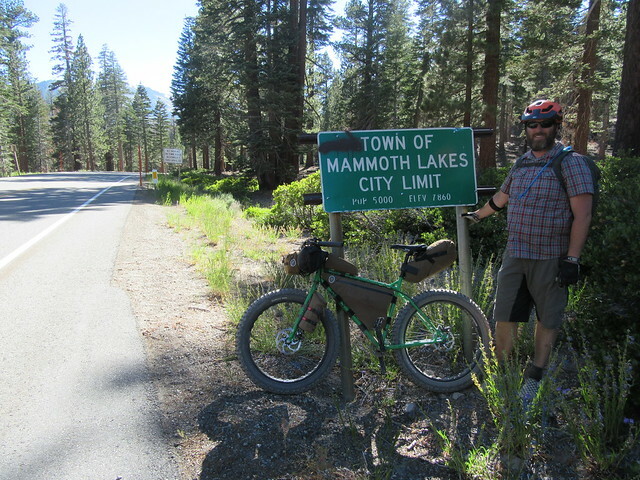 We also saw signs marked Mammoth to June on roads headed north. Most helpful, though, were all the Forest Service road signs. 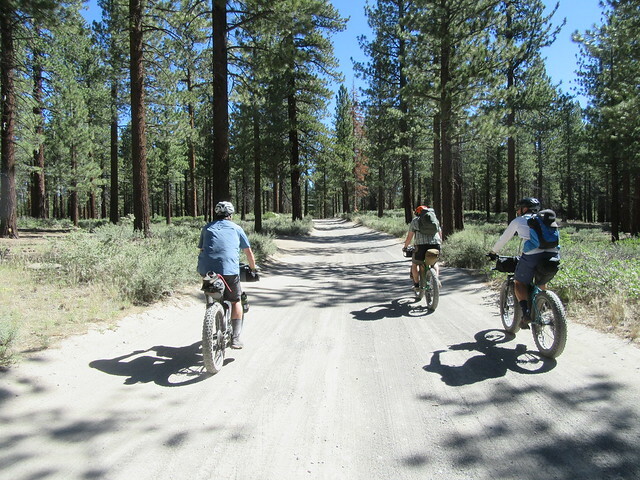 Most of them were on our Forest Service map, and it was easy to check our progress and pick the best road. 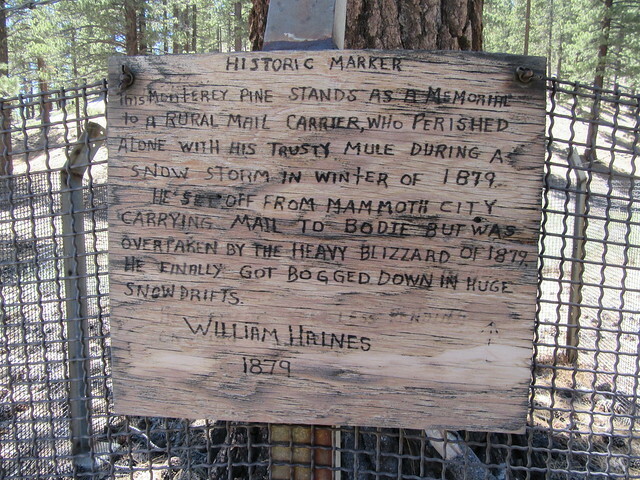 As we neared Glass Creek Campground at the bottom of Deadman Summit, we passed a memorial to William Haines, a mail carrier that perished in a blizzard in 1879. It’s said that Haines is among the dead that contributed to the Deadman name in the area. In 1861, the burned and headless body of prospector Robert Hume was found in a shallow grave, his head later discovered nearby in a stream now known as Deadman Creek. And a few years later, the remains of two nameless prospectors were found near the bottom of what is now Deadmans Pass. All reminders of the sometimes lawless and hard life of the wild west. 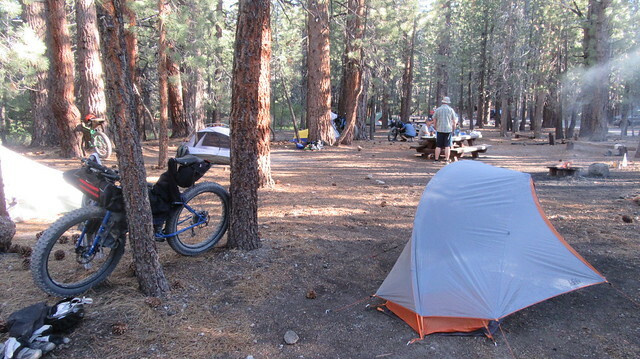 Just off Highway 395 is the Glass Creek Campground. This free campground was full of RVs, many hauling ATVs to explore all the area roads. 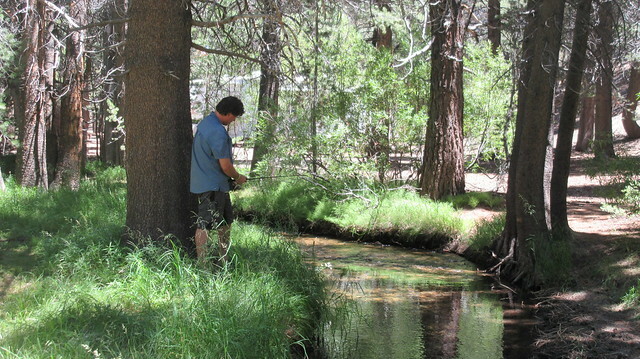 This campground does not have water faucets, but water can be filtered out of the creek here if needed. 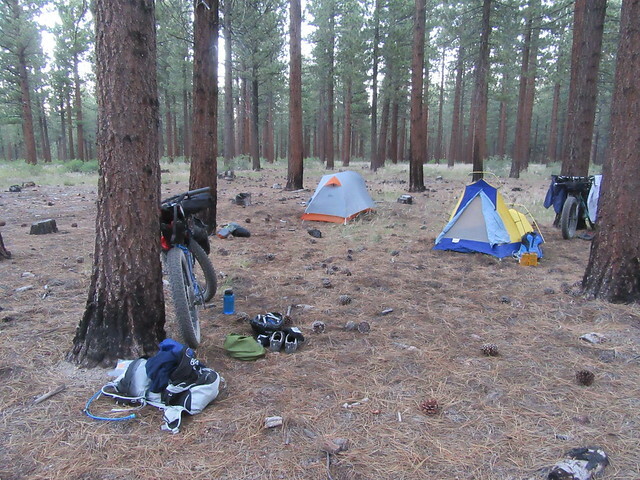 It didn’t look like it would be the quietest of places for bikepacking. 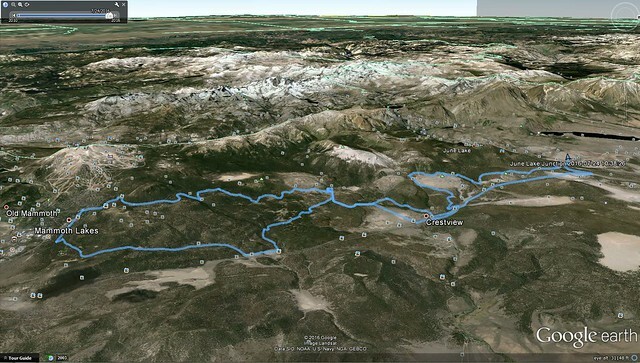 We continued southwest towards Deadman Creek Road. The road was soft here, and I remember thinking it felt like the steepest flat road ever. 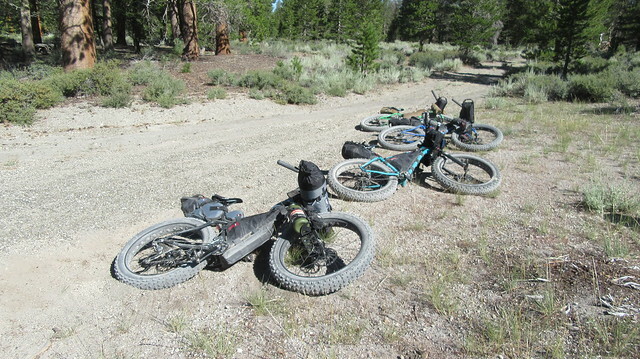 We were soon at the heavily used Deadman Creek Road, though, and it gave us a nice break. Even the climbs weren’t too bad. 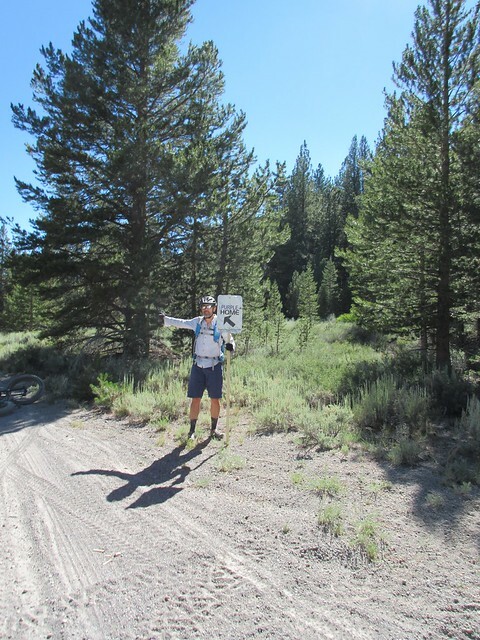 We stopped at Deadman Creek Campground to check it out. 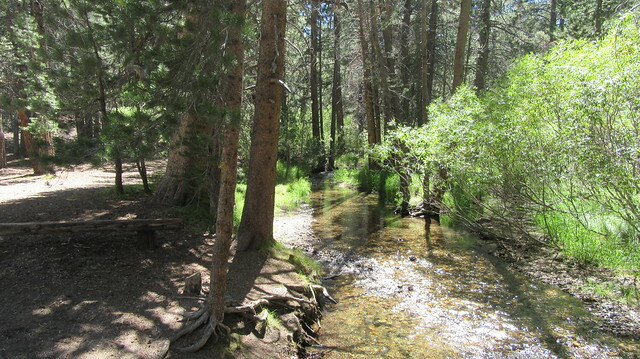 Deadman Creek separates lower and upper camping loops. It was quiet and tempting to stay, but we still had plenty of miles and daylight left in us. We decided to press on to Mammoth. From the campground, we headed south along the base of the Deadman Lava Dome. The rolling terrain continued for quite a while here, never descending or climbing for very long. 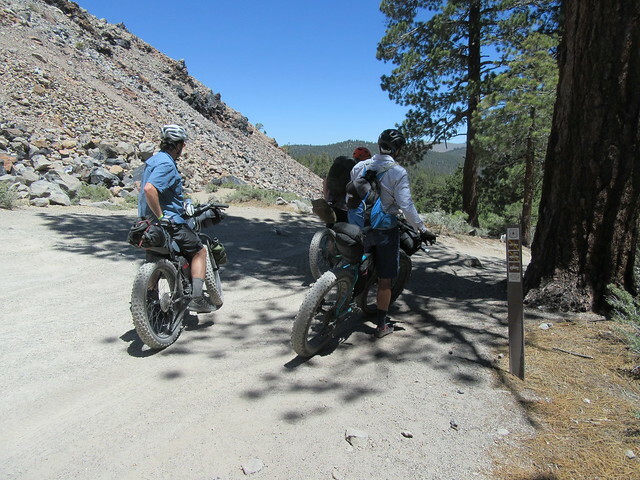 We passed a turnoff to Inyo Craters, two deep craters with water in the bottom of them, but didn’t have the energy to climb the hill to see them. 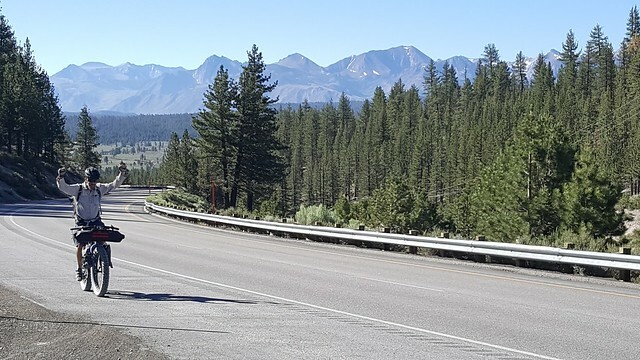 As the miles went by, our desire to get to Mammoth increased. 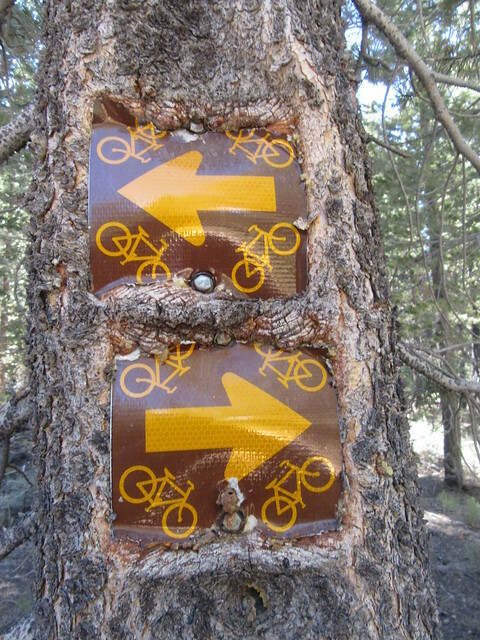 We started to see some mountain bike trail signs the closer we got to Mammoth. Not knowing what they symbolized, they looked pretty confusing. The occasional singletrack crossed the road, so it’d be nice to learn where these go and incorporate them into a future ride. They weren’t on our map, though, so we didn’t chance being led into an unexpected hill climb or in the wrong direction. I’m not sure where you want me to go! 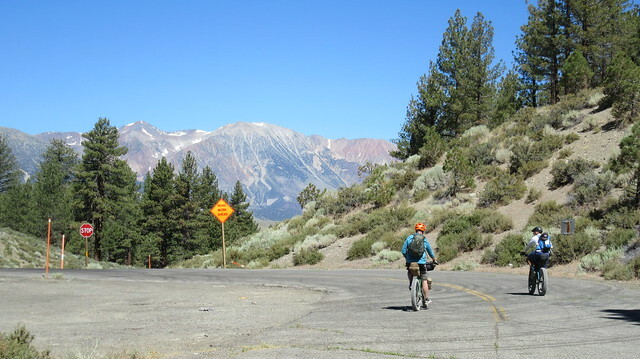 We eventually made it down to the Mammoth Scenic Loop, a paved road leading into the town of Mammoth Lakes. Before we got to town though, we had to first climb up and over a pass, the highest point of the whole ride. The pavement made the climbing slightly easier, but the road seemed to go on forever and we were tired. Finally we topped out and got to coast or pedal easy down into town. We were in for a shock to the senses. 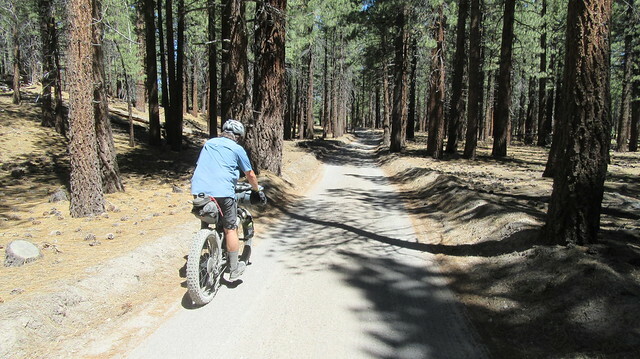 One moment we were in the woods, and the next we were in the resort community of Mammoth Lakes. It had been mostly quiet all day, but now there were people everywhere. Live music filled the air from the Reggae Festival in progress. 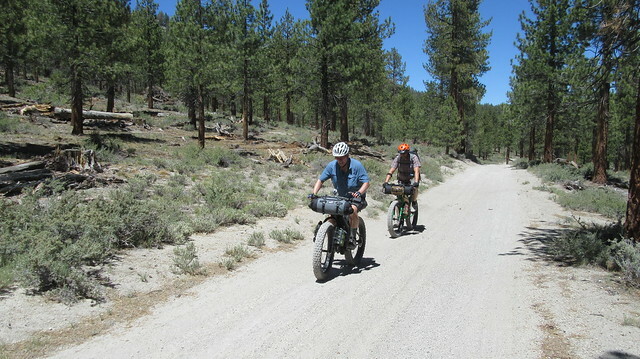 We continued down the road through all the activity, intending to check out the Shady Rest Campground. 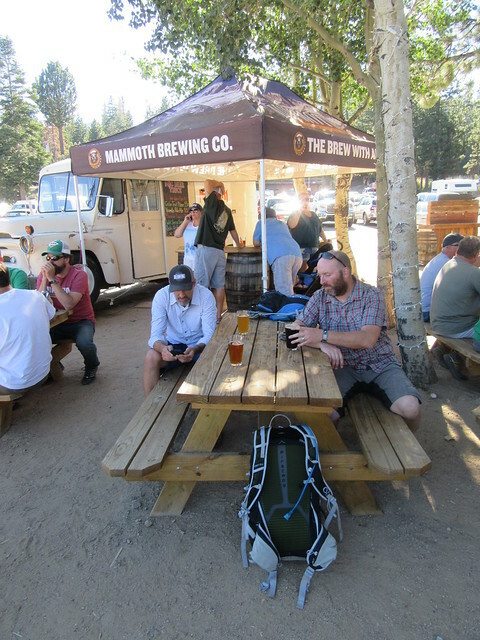 Suddenly, breaking from his exhausted posture on the bike, one rider exclaimed, “It’s the Mammoth Brewing Company!”. 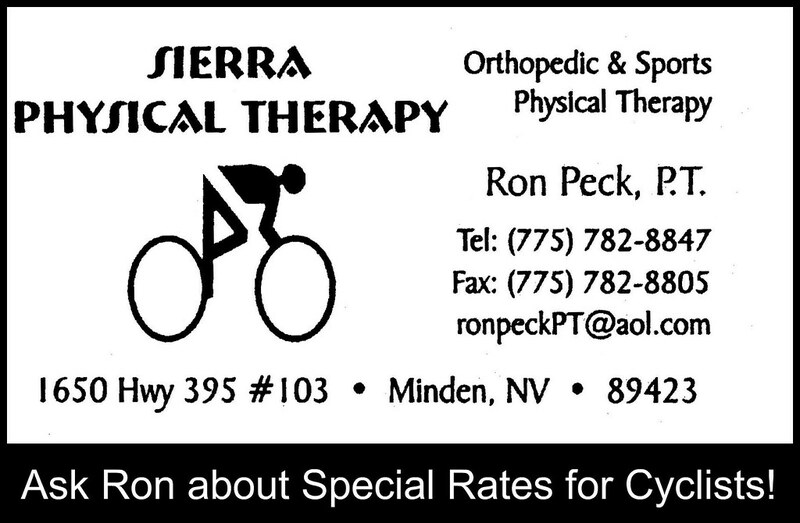 He pedaled ahead with new found energy, directing us off the road where there was a sign that read, “Beer Garden”. Another sign pointed bikes to a nearby and full bike rack. We parked and entered the beer garden that was full of all sorts of outdoor type folks. We couldn’t have been more happy at that moment. The campground could wait. 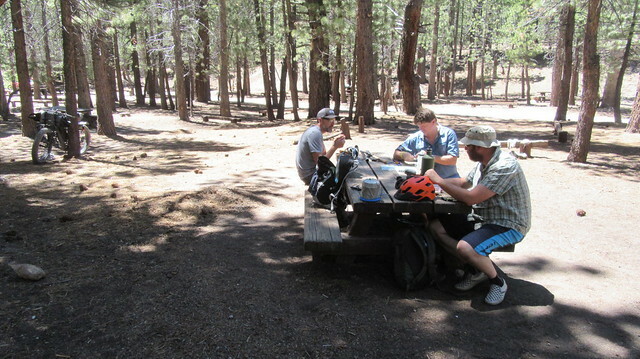 After filling our bellies with beer, BBQ, and burgers, we rode off to check out the Shady Rest Campground about a mile down the road. When we got there, both loops were full to capacity. We stopped to top off our water, then headed north into the woods where one of the locals said to go if the campground was not available. It didn’t take us too long to find a suitable place to pitch the tents. 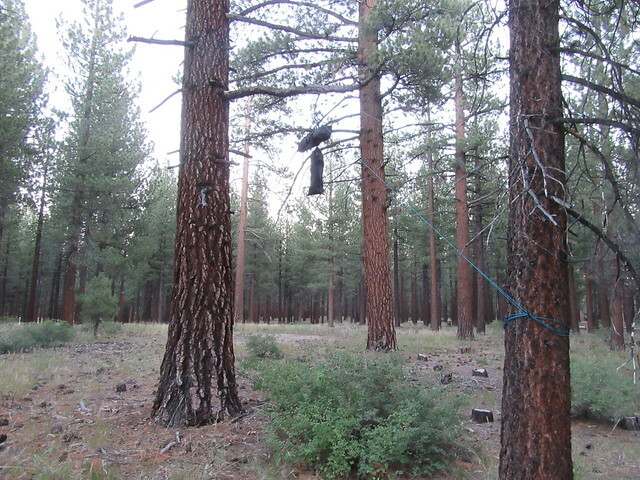 With dinner out of the way, there wasn’t much to do besides setup camp, hang the food so the bears wouldn’t get it, and hang out until dark. We talked until nightfall, but when we saw that it was 9:00 PM, we all headed off to our tents without hesitation. I slept great that night, and didn’t get up until 7:30 AM, the longest I’d slept in in a while. We didn’t have a plan for the second day yet. 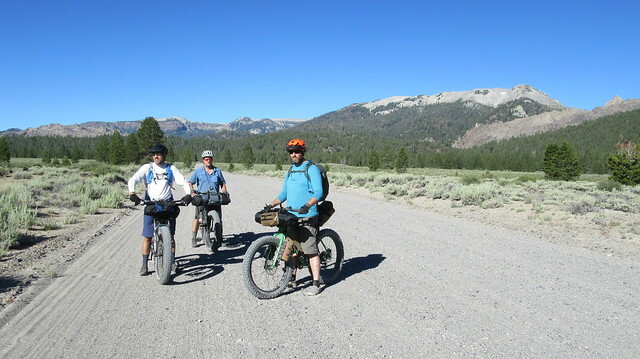 Although it would’ve been nice to explore Mammoth Lakes some more, we all wanted to make some mileage north for the day, and not have a huge ride on the third day. We also didn’t want to climb way up through town again, so we looked at the map and discovered that we could just keep heading north from our location and get to where we needed to be. With limited water sources available, we decided to head back to Deadman Campground. We chose roads with gentle climbing and the most direct path to our destination. The riding experience on this morning could actually be described at pleasant, just a cruise through the woods. Especially when compared to the previous day. 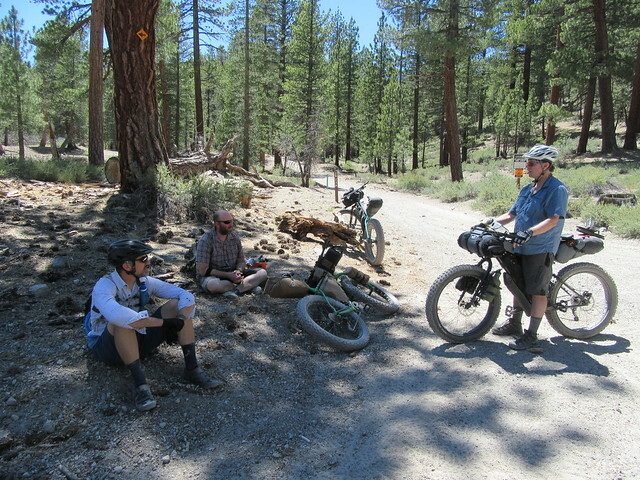 By noon we were back at Deadman Campground after only two hours of riding. It seemed strange to stop so soon, but the only other water sources weren’t very desirable. We chose to setup camp and have a day of leisure. The creek is the only available water source at the campground, but it was nice and clean. We all filtered or treated water throughout the day to get rehydrated. A couple of the guys had fishing licenses and tried their luck in the creek. 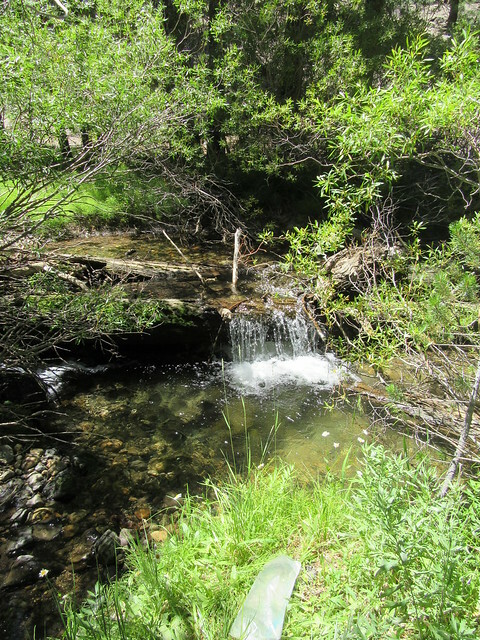 I chose to explore the area on foot and even took a much needed dip in the cool creek. That looks like a good place to take a dip! Later in the day one of our anglers came back to camp with half the posted daily limit: One smallish rainbow trout. Quite the bounty! 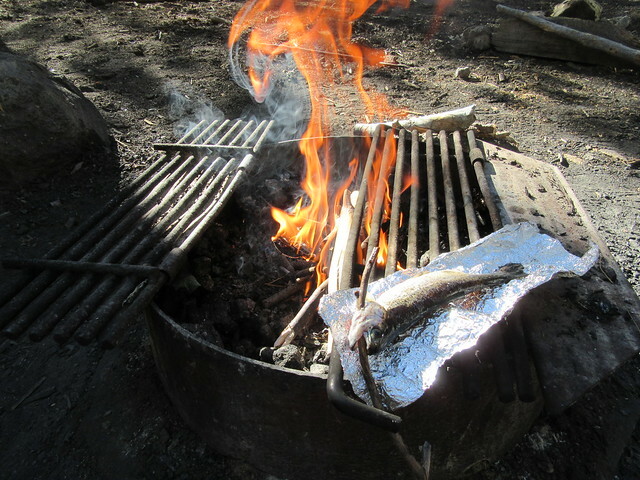 The previous camper left some firewood, and I had some aluminum foil in my fire kit handy to wrap up the fish. Dinner was started. 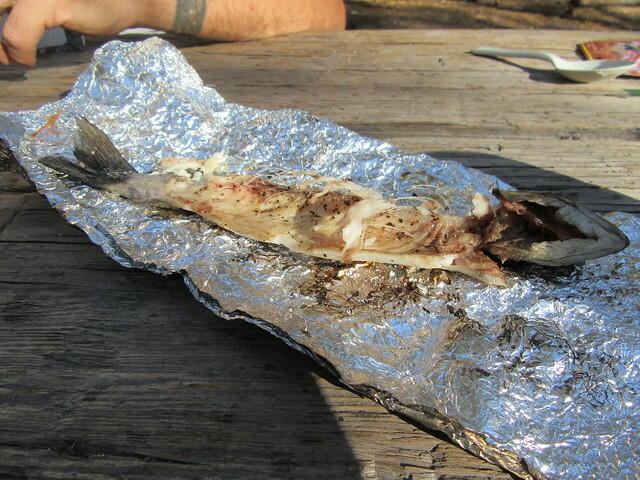 While the fish was smokey and delicious, we were all glad that we had brought additional food with us. It did make a nice side dish, though. 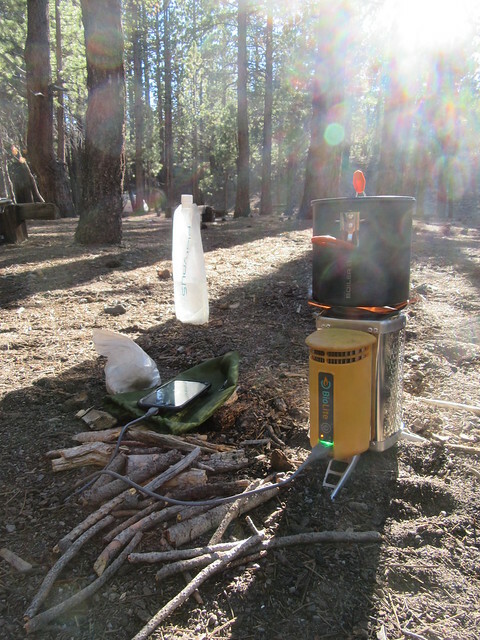 While our freeze dried dinners weren’t quite up to par with the food in Mammoth Lakes, we all ate good that night. 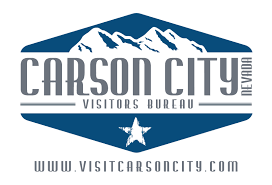 Evening cocktails were courtesy of Pronghorn Spirits, a brand new Carson City area distillery! The whiskey made a nice end to the relaxing day, and paired well with the evening campfire. 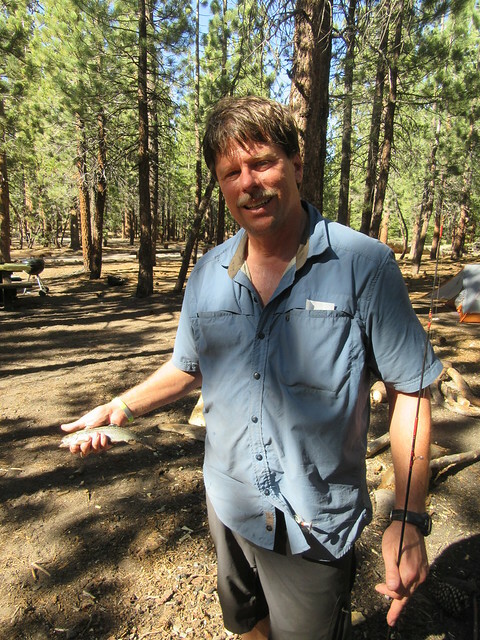 There are a few community bear boxes scattered throughout this campground, but none were very near our site. Additionally, some were padlocked by campers that were away. We ended up hanging our food again, so I was glad that we had brought 50 feet of cord with us to get the job done. The stuff sacks and bike bags doubled as great bear bags to hoist up into the air. We got up early the next morning, eager to get out on the trail before the heat of the day. We agreed that the first person up would get the rest of us up. This worked well with the exception of one camper. He took about 20 minutes longer to wake up, partially because he decided to sleep with ear plugs in. Small stones thrown at the tent had no effect. An elevated, “Good Morning!” aroused no movement in the sleeping chamber. Yikes! 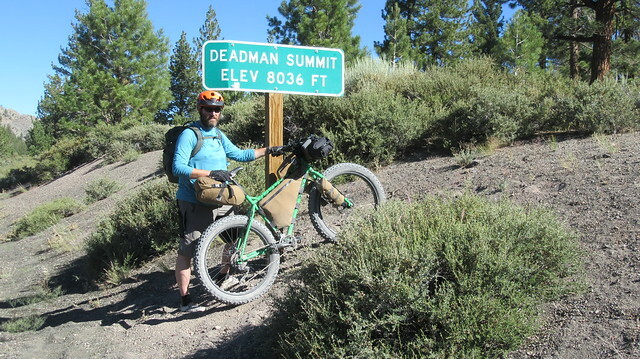 Did the Deadman legend live up to its name? I went back to my coffee to return later. Finally, a harsh wrapping on the tent poles mixed with shouting brought the comatose camper to life. “It’s 6:20 AM! !”, he lamented. I wasn’t sure if he was irritated that we let him sleep in, or if he was simply appalled that his slumber was over. But whatever, he agreed to the wake up time, so it wasn’t my problem. I went back to my coffee. We were packed up and ready to go much earlier this morning. The biggest challenge of the weekend now awaited us: The campground bathroom. We must’ve timed it a few days before its biannual cleaning. Those that returned from the evil brown shack brought back horror stories of a suffocating evil that lies within, stoking the fears of those who had not yet been. But being brave, we all took our turn and survived. A walk off into the woods would’ve been a much better choice. 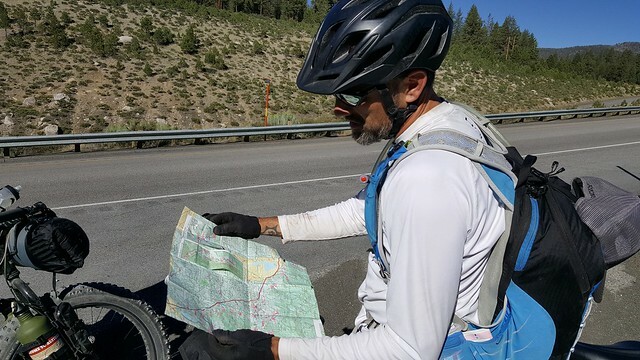 Not wanting to attempt the steep sandy climbs of Obsidian Dome, we set a course for Glass Creek to meet up with the highway. We got a few easy miles out of the way with a descent to the pavement. While climbing the road wasn’t the most interesting route, the lighter Sunday morning traffic and cool temperatures made the trip up Deadman Summit tolerable. The shoulder is nice and wide here, and there was even a phone signal, allowing me to check in with home during the climb. Happy to get to the top of Deadman Summit without much difficulty, we searched for a route back that would get us off the pavement and back into the dirt. 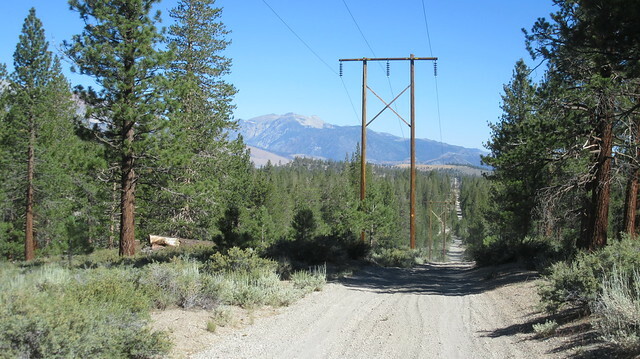 We found just what we were looking for along a powerline road. It went off into the distance, and looked like it would take us just about all the way to the trailhead. We were way ahead of schedule as we made the final climb. Still, my legs knew we were almost back and started to give up the fight. 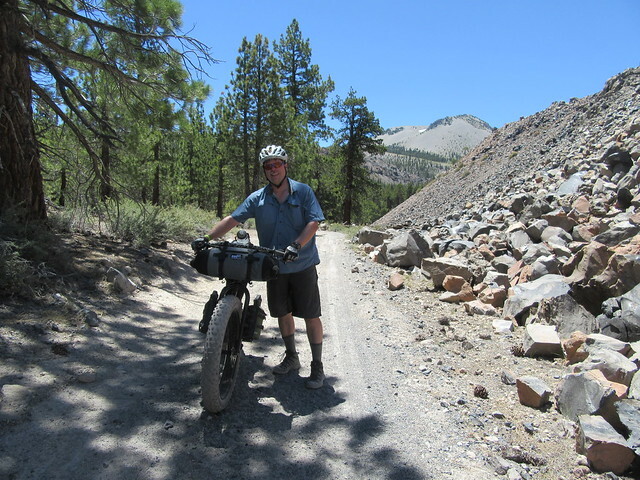 I was happy to see the pavement again and fly down the hill back to June Lakes Junction. 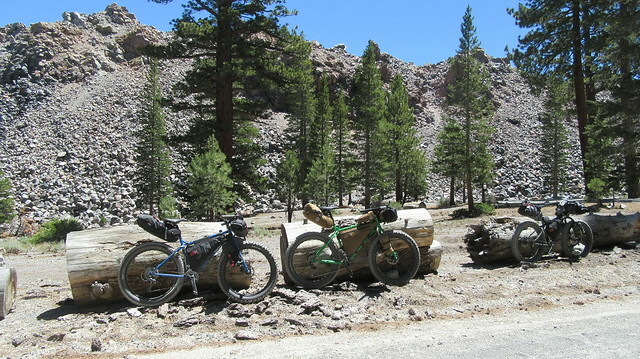 We got the bikes and gear all loaded up, and headed up the June Lakes Loop to get to June Lake Brewing. We arrived to find that we were just 10 minutes shy of opening time at 10:50 AM. 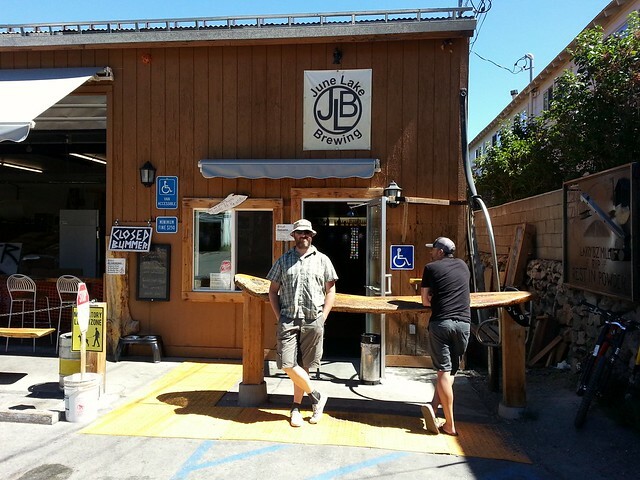 We waited patiently outside, and then ordered the first brews of the day. At first I felt funny ordering a beer so early, but then the place quickly filled up to capacity. A nearby food truck delivered a heaping plate of nachos and tacos. It was the perfect end of the ride! This being only my second bikepacking trip, I learned a few things over the weekend. I’m used to packing for hiking backpacking trips. In this scenario, everything is separated by function, bagged, and dropped into the big backpack for easy retrieval later. 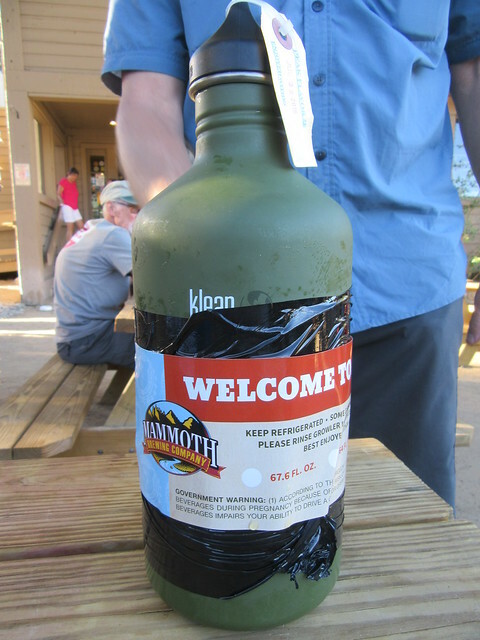 This turns out not to work so well for bikepacking. 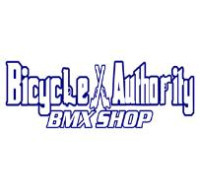 With numerous packs of various shapes and sizes on the bike, it’s best to pack something where it fits best. This means un-grouping things, and and then sometimes later trying to remember where the heck you packed it. Only one rider in the group did the trip without a backpack on. The weird thing, though, is that he seemed to have everything, almost to the point that we believed he had a magical bottomless bag. What we noticed, though, is that he had a few more smaller bags on the bike than we did. He also took the extra time to repackage items into the smallest possible containers. If there was a smaller version of some item available, he had it. I plan to go through my gear again, and see where I can improve. There were definitely a few items I never took out of my pack once. A couple more small bags may be ordered soon as well. As far as the route goes, I don’t think there is a right or wrong way to do this trip. There are so many roads to choose from, that I think it’s just best to explore and do what feels best for you. 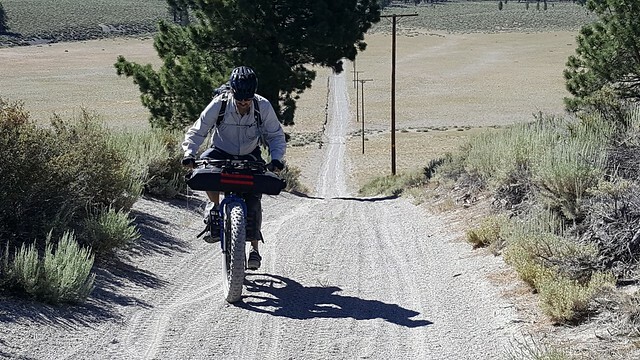 And finally, I learned that I really enjoyed bikepacking. Can’t wait to get out and do it all again!